Inami Anju was unusually late today. Or was it Saitou Shuka that came in unusually early? Furihata Ai came soon after her because CYaRon was gonna have their livestream today and they still have 45 minutes more before they start. "Hey! She&apos;ll be here soon, why don&apos;t we go ahead and take pictures?" Aiai mirrored Shuka&apos;s smile and nodded in agreement as they went ahead and took pictures. Anchan came in when there was only 5 minutes left till their livestream. This wasn&apos;t her usual self, usually she&apos;ll be an hour early but last night, she and Shuka ended up talking till 4am so she supposed it&apos;s not so unusual. She hurried her way towards the studio, only to stumble upon Aiai and Shuka taking pictures, and a lot of pictures. Anchan suddenly felt the sudden urge to pull Shuka away from Aiai but she held it. Instead, she went to them. On the next picture Aiai and Shuka took, Anchan was behind Aiai, hand on Aiai&apos;s shoulder while pouting. Anchan didn&apos;t even notice she was pouting not till Aiai chuckled a bit. "Anchan! You&apos;re finally here!" Shuka exclaimed as she went towards Anchan and gave her a hug, which Anchan halfheartedly returned. "You look tired" Shuka said, examining Anchan&apos;s poker face while gently caressing it. "Let&apos;s go, they&apos;re calling us" Anchan said sternly and went ahead, leaving a pouting Shuka to follow her. For the entire duration of their one hour livestream Anchan was beyond clingy! Not only did Aiai and Shuka notice it but so did the viewers. Most of the comments consisted of "AnShuka!" "ChikaYou!" since most, no not most, every single second of the livestream Anchan was with Shuka. Intertwining their hands, leaning her head on Shuka&apos;s shoulder, even going as far as to exchanging places with Shuka every time Shuka was beside Aiai. Shuka didn&apos;t mind and so didn&apos;t Aiai but that didn&apos;t stop Shuka from approaching Anchan after the livestream. "Hmm" Shuka acted like she was having second thoughts as Anchan cupped her cheeks and looked at her seriously. 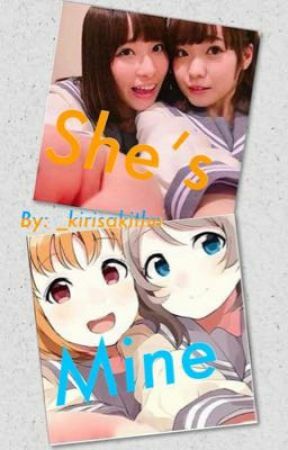 "I won&apos;t" Shuka muttered and both of them gave each other the best smile either of them could muster.